1. 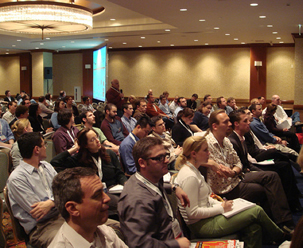 Higher Quality Presentations – The gross number of speakers has been pared down considerably. Rather than panels with 5 or six speakers competing for 10 minutes of presentation time each and just a few minutes of Q & A, there are far more panels with 2 speakers and a moderator. Plus there are many more solo presentations from insanely smart people like Bryan Eisenberg, Bill Hunt and Mike Grehan. The great thing about fewer speakers is that it gives them more time to drill down into the details. More in-depth presentations means attendees get an opportunity to understand the high level concepts as well as the practical details to act upon once back in the office. It’s virtually impossible to do that in 10 minutes. With more time to present, there’s more time to learn the things you need to know in order to make positive changes in your online marketing. Of course the topical mix is worth noting as well, covering the gamut of Search, Social Media, Analytics and specialized tracks from IAB, Reaching the Latino market and in depth training opportunities. 2. Buyers Galore – In my experience, there’s something about SES New York that brings out a lot of company marketers that are not only looking to educate themselves but to source consultants and services. Maybe it’s an East Coast thing or maybe it’s a “Let’s get down to business” attitude that comes with NYC. All I know is, when I come back from SES New York, I always have a great list of new contacts. It’s not enough that there are buyers present though, there must be opportunities to meet and engage. New York provides numerous opportunities to do just that. 3. Agencies Abound – Madison Avenue and the numerous East Coast agencies from nearby cities come out in force for SES New York. Actually, agencies from all over the world attend SES New York including my own, TopRank Online Marketing (yeah, that was a plug). This is great for a few reasons: You’re looking for an agency to hire, looking to be employed by an agency, seeking new marketing partners with expertise that your agency does not have, conducting competitive intelligence or maybe recruiting. It’s always interesting to see how other agencies package their information. 4. Full Exhibit Hall – Another great place to meet prospects, media, vendors, partners and potential new hires is the exhibit hall. 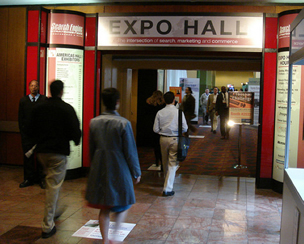 Besides the exhibits themselves, there are usually sponsored happy hours or other events in the hall. SES is very good at selling out their booth space so you can count on a lot of different companies to learn about and connect with. In fact, there will be over 100 exhibitors at this year’s SES New York conference. For companies attending SES looking for services, especially technology solutions, seeing the CEO or a subject matter expert speak about a case study using their software or online tool and then visiting the booth in the exhibit hall to get details and a demo can be a great combination. 5. It’s New York City, Fuhgeddaboudit – For many, being in New York is enough by itself, but of course the knowledge gain and networking plays a part too. It’s often said that much of the “good stuff” in terms of highly prized secrets of SEO, or other disciplines are traded over food and libations after the event. What better place to network and talk shop informally than at one of the plentitude of diverse restaurants in New York? If you’ve attended a conference in New York, what’s your favorite thing about having an event there? What were your most memorable experiences? Check out SES New York’s information page for a full schedule of sessions and training. Also be sure to check out the Content Marketing Optimization panel with TopRank’s Jolina Pettice on Thursday March 24 at 3:15. Seems like its going to be another big turn out..you guys have fun and hopefully learn something.. I enjoy doing shows in NYC because it is extremely easy to get around, and there are plenty of options for everything, everywhere. I never have to worry about my team finding a place to eat or figuring out how to get from point A to point B, all is very easy there. haha I need to get to NY sounds sweet! Eventually, I’ll come back with a longer post about this myth that seems to go around that more speakers on a panel means, somehow, less learning. I’ve seen it in a number of places. Pick any of the excellent TED talks that are out there online. You can learn huge amounts from people who speak for only 3-18 minutes. No one goes longer than that. No one. Pick any Ignite event. Those videos are online, as well. You get 5 minutes, max, to talk. That’s it. No ifs, ands or buts. I’ve spoken at Ignite many times. Putting together a 5 minute talk can take much longer, and be much harder to do, because you have to really think carefully about the essentials you want to say. No going off on tangents and so on. And people deliver great content. Personally, I don’t believe in any one size fits all rule for the sessions that we oversee for SMX. Some sessions make sense to have solo speakers. Some make sense to have two people. Some three. Sometimes four. In our all-Q&A “Ask The SEOs” panel, we might have 6 speakers — but no PowerPoint. To me, the key is that the sessions are organized. If you have three speakers, each talking 18 minutes and carefully coordinated, you’ve got a great session. You also tend to ensure you’ve got a good diversity of opinion in a space where, as you know, sometimes people just don’t agree. Thank you for the comment Danny. I agree, it comes down to how the session is managed: from topic, to speaker selection to moderation. SES has been very proactive about the cycle of delegate feedback to content programming and structure, greatly influencing the current format. Of course that’s the mark of any good conference SMX included – although I don’t know that first hand. SMX is one of the few SEM events I haven’t been to. Hopefully that will change at some point. Not sure that anyone thinks there’s a myth about not learning from panels with more people on them. I think Lee’s point is that we listen to what the attendees of our conference prefer in terms of format and delivery and give it it to them. Listening to our audience and executing on it is a great success factor for us. If larger panels seem to be what the audience at SMX wants then I’d stick to whatever works for you, of course. As you mention above, different conferences have difference approaches. Hope SMX West is a huge success for you this week! The myth is simply that I’ve seen a number of blog posts over the past few months that suggest that big panels are bad. They are not. It simply depends on the topic, speaker line-up and preparation. Small panels can be worse than big panels if you have a solo speaker who doesn’t see some SEO or PPC issue from more than their unique perspective. Or good, that’s all. Lee wrote that with speakers only having 10 minutes to speak, it’s “virtually impossible” for attendees to learn. That’s just not right. TED and Ignite remain excellent cases in point. I totally get that SES might get getting feedback that its attendees want smaller sessions. I totally agree if that’s what you’re hearing, go for it. But to say that this means SES has higher quality sessions overall than other shows, as Lee does, while I respect him greatly, no … that’s just not right, and it’s especially not right when it sounds like he hasn’t been to some other shows like our own to actually see firsthand if size really matters. Bottom line: SMX runs a mixture of sessions. They all don’t have several speakers that talk for short periods. More important, those that do are prepped to make that work. We listen to our feedback like anyone who is serious about events. People are happy. If they weren’t, we would be able to guarantee our shows. Best as wells with SES NY later this month! Hi Danny, I suppose as someone who runs conferences, you might have a different perspective on a post that promotes another event and assume there’s some kind of comparison going on. Sorry to disappoint if that’s the case, because this post is my opinion about New York as a place for conferences and about what to look forward to with SES New York. If you want to make it about SMX, that’s your choice, but all due respect, it’s out of left field as far as I’m concerned. If there are other blogs writing about big panels and you run an event with some big panels, maybe you’ve already addressed this with them? I’m sure SMX is a great conference knowing who is involved with it. I share no opinion or comparison of it because I’ve simply never been to one.